Not another sequel, you asked? Well, it is & be prepared as it's already an "It" trend in Tinseltown. 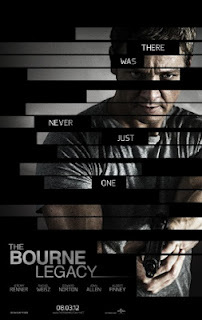 So, how does this fare compared to the previous Bourne series? Gah, another comparison & I know...it's inevitable. I'd have to say The Bourne Legacy is by far the less exciting of the Bourne series. It's not like Jeremy Renner is less convincing as the next secret agent/tactical espionage. The whole film doesn't feel engaging enough. It must be the plot...somehow less intelligent (please don't hate me). In short, this film is a spin-off whereby the timeline is concurrent with the incidents happening in The Bourne Ultimatum but based in a different location. Aaron Cross (Renner) is a member of the Operation Outcome, a program which enhances physical & mental abilities in field operations through pills. The public exposure of Treadstone Project & Operation Blackbriar by Jason Bourne's actions in Ultimatum has led to immediate closure of Operation Outcome - massacre of all parties involved. Aaron faces life & death; struggling to survive from the assassination plan & also suffering from the side effects after lacking consumption of the "blue" pill, which boosts intelligence. He rescues Dr. Marta Shearing (Rachel Weiz), sole survivor of Outcome's research team & pleads for her help to cure his condition. The solid 2 hour movie doesn't seem to have much premise especially during the chasing scenes between the assassin & Aaron/Shearing felt like it's taking forever to come to an end. Draggy is the word. Frankly, I was whispering to WL & literally begging for it to be over for good. Worth the watch? It depends. Don't bother watching if you didn't watch the previous movies starring Matt Damon because that's how the Legacy's platform was built. To those who have loyally followed the series, watch this to add another title to your have-watched list. But beware, it's not that exciting.